As a person with the decision-making capacity, you have the right to make your own decisions about matters that affect you. If you don’t want to give an enduring power of attorney, you can appoint a supportive attorney who will support you in your decision-making process. It could be due to a disability, illness, injury, or trauma that you would have an appointed supportive attorney. If you value the support someone can give you in the time of deciding certain matters, a supportive attorney can help you communicate and organize your decisions. In Victoria, the appointment of a supportive attorney is a legal document. You still have your own rights and independence and you should find a supportive attorney who you trust and who you believe will respect that. You can decide if you want them to only support you with financial matters, personal matters, or both. A supportive attorney, however, can not make any decisions concerning your medical treatment. You would need to appoint a medical support person. As your supportive attorney, you can give them the authority to access, collect, or obtain information on your behalf. They can also assist you if you do not want to give them full authority. Organizations such as banks, utility providers, and Centrelink will be authorized to disclose your personal information to your supportive attorney. Along with the ability to receive information, your supportive attorney may also communicate your decisions and take reasonable action to give effect to your decisions. 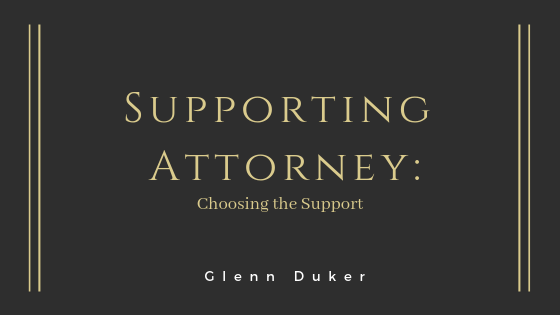 You may appoint more than one supportive attorney to act separately from each other. You may feel more comfortable having one person you trust with your financial decisions and another person to handle your personal decisions. The positive aspect of having a supportive attorney is that you are still in control of the decisions being made.